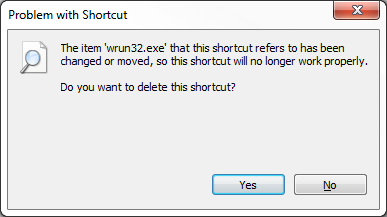 Sometimes your software shortcut / icon will vanish, begin to open a different application or return an error when you try to run it. These are a few reasons this the shortcut / icon will vanish. Check your Recycle Bin and restore it if you find it there. You're logged in as a different Windows user. Log in as the correct Windows user. You lost network connection, tried to start the software using the icon, and Windows offered to remove it for you. Ensure that your network connection to the server is active and recreate the shortcut. This is the reason that your shortcut / icon will begin to open a different application. Your computer couldn't find the application, either because it's missing or you've got network or permissions problems. When this happens, you'll usually get the message "Missing shortcut" which is shown. below. Delete the broken shortcut / icon, and recreate it. This is the reason that your shortcut / icon doesn't respond or returns a "drive or network" error when you try to run it. changed or moved, so this shortcut will no longer work properly. DO NOT CLICK YES! 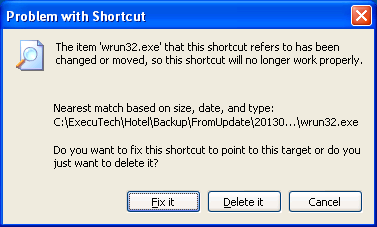 If you clicked Yes on this message, your shortcut was deleted. locate the file yourself, click Browse. You should always click Cancel and give us a call. Don't try to fix it by clicking Browse. We may ask you to contact your IT professional if the software can no longer be found. If you wait a few minutes you'll see this new message . . .
just want to delete it? You should always click Cancel and give us a call. Don't click Fix it or Delete it. sure that the disk is properly inserted or the network resource is available, and then try again. You're having network problems. Contact your IT professional.